A triple challenge card today. This card is for the Mojo Monday 197, and at Splitcoast the Color Challenge 329 and the Teapot Challenge 152. The Color Challenge is Melon Mambo, Soft Suede and Crumb cake with a butterfly for dessert. The Teapot Challenge calls for numbers on your card. The cardbase is a 5 1/2″ square in Melon Mambo and then Early Expresso. The multicolored background is Crumb Cake that’s been stamped in Melon Mambo and Soft Suede. It’s been stamped with numbers, butterflies and different word images. Then it was dry embossed and then I added some faux stitching. The frame also has been dry embossed, as were the three layers of the butterfly. The butterfly was stamped before dry embossing. The large Early Expresso brad has been topped with a punched dot in Melon Mambo. I used a Sizzix flourish in behind the layered flowers and the used the same type of brad again. The sentiment has been stamped in Early Espresso and overstamped with the butterfly image that had been stamped off. Hope you have a marvelous Tuesday! 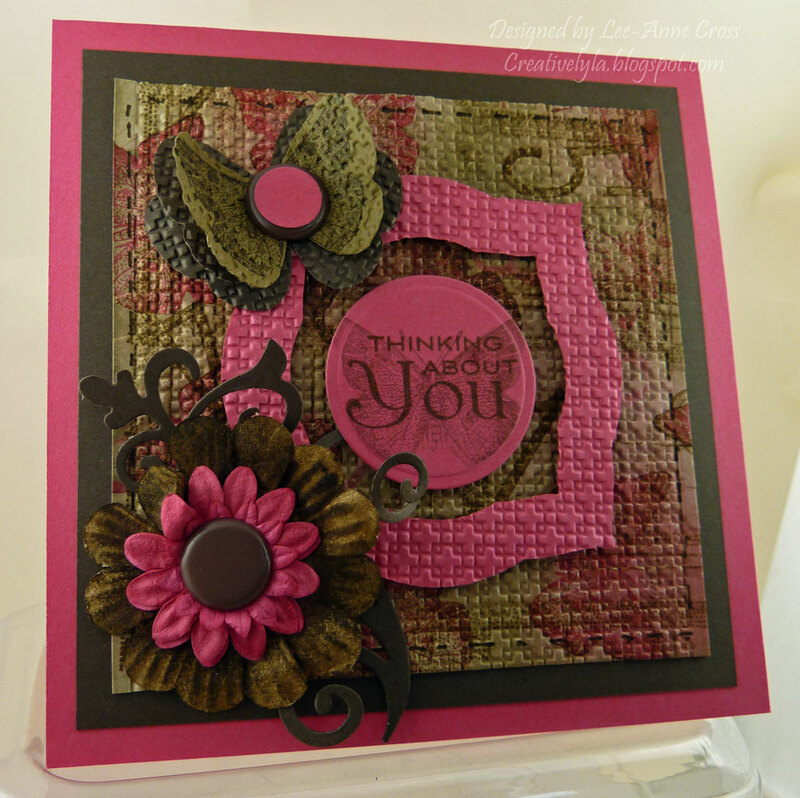 Such a pretty card, Lee Anne! I love the dry-embossing! Next Next post: Mousy birthday!